This correspondence includes letters received by C. A. Morris, the Kansas Adjutant General, on a variety of topics but most of the letters concern recent fear of Indian raids or their aftermath. Many letters are requests for pay for, or resignations from, militia service, and requests to return or redistribute guns and ammunition. Later in the year communities are again requesting arms and enrolling local militia units for protection against feared raids by Indians. Advertisements and solicitations from arms and ammunition dealers also begin to appear. Railroad companies also make requests for arms and related supplies to help protect their interests. Some letters are addressed to Governor Thomas Osborn. 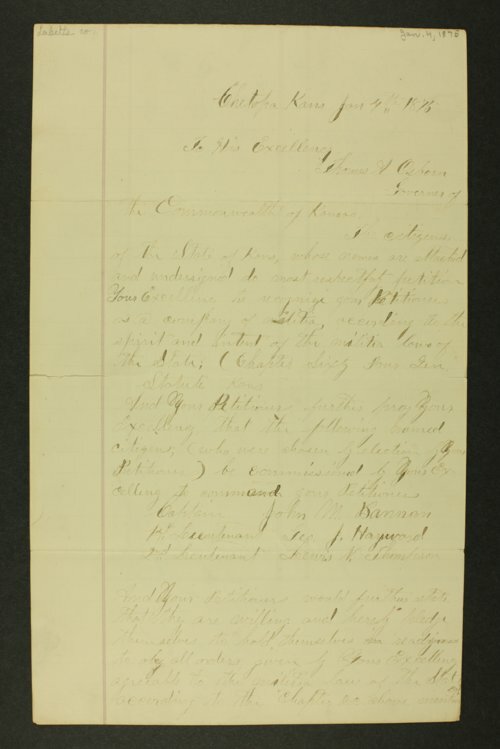 General John Pope, commander of the Department of the Missouri at Leavenworth denies a request for information about Indians recently taken into custody who may be suspected of involvement in raids on white settlers.